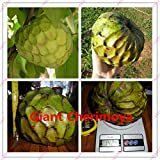 Annona for sale – Easy plant to grow with edible fruits, also grown for the ornamental leaves and for the structure of the tree, planting in spring to autumn and better to buy plant or grafted tree or another option to start from seeds yet more challenging. Growing information: perennial plant, growing hardiness zone: 10+, water needed – average amount, light conditions – full sun to partial shade, height: 2-10 m, 6-30 feet. Blooming in the spring to summer in bowl shaped flowers that appear in green-yellowish color. Fruit harvesting in the summer to autumn in shapeless to round shaped fruits that appear in white inside color. 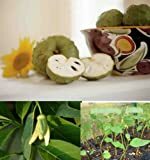 Annona for sale – What need to know before buying Annona plant? What is the season to buy Annona plant? Annona for sale – need to know before buying Annona plant that it’s fruit, the tree need full sun, average amount of water, 2-10m, but better keep it small in order to make hand pollination there is problem with pollination, season for seeds can be all the year but keep them in dark, dry, room temperature to cool place, sow in in the spring, for plant better in the spring, possible early summer.